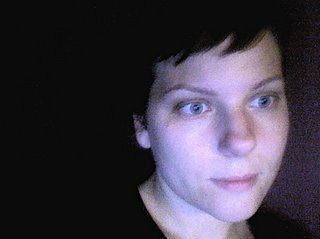 Kristi Maxwell, author of Realm Sixty-Four (forthcoming from Ahsahta Press), is pursuing her doctorate at the University of Cincinnati. Her poems have most recently appeared in 580 Split, Coconut, How2, Spinning Jenny & Tarpaulin Sky, & her poems are forthcoming in Backwards City Review, BirdDog, Lit, POOL & the tiny. In her non-language-related time, she likes to practice kung fu. Kerri Sonnenberg lives in Chicago where she directs the Discrete Reading Series. In 2004 Litmus Press published her first book, The Mudra. 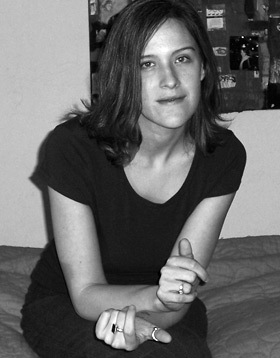 Her chapbook, Practical Art Criticism (Bronze Skull Press, 2004), will be included in the forthcoming anthology The City Visible: Chicago Poetry for the New Century (Cracked Slab, 2008). Recent writings appear in MiPoesias, Magazine Cypress, Factorial & in the Unpleasant Event Schedule. G.C. Waldrep's first book of poems, Goldbeater's Skin, won the 2003 Colorado Prize for Poetry, judged by Donald Revell. His second full-length book, Disclamor, is forthcoming from BOA Editions in 2007. He is also the author of two chapbooks, The Batteries (New Michigan Press, 2006) & One Way No Exit (Burning Chair, 2006). His poems have appeared in Ploughshares, Kenyon Review, Boston Review, New England Review, Georgia Review, American Letters & Commentary, Slope, Octopus, Tin House, New American Writing, & other journals. He teaches at Kenyon College in Ohio.